Good morning everyone! How are you today? I'm having a bit of an Indian Summer here today! It's supposed to be 75 and sunny! Perfect pumpkin carving weather! Of course, tomorrow the temperature is going to drop and the forecast says we are going to have some snow this weekend. Typical weather for this time of year! It's Tuesday, so that means that it is time for another Twinsie Tuesday! Since Halloween is Friday, we are posting Halloween themed manicures! I have yet to mention on the blog that I'm really not the biggest fan of Halloween. I hate all the gruesome and gross things that go along with it. I only enjoy the cute little decorations. Therefore, you can guess that I only really enjoy the cute Halloween designs. 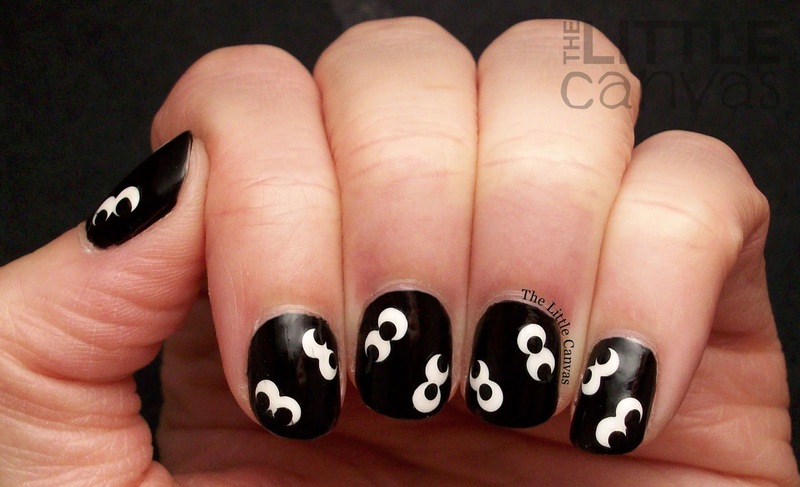 For my manicure, I went simple and re-created my googly eye design, which I did last year and again on my nail art wheel! It's one of my favorite Halloween manicures and I've been dying to do it for a few weeks now. Reason being, it's adorable! Adorable, right? Another manicure where I'm using Faby Black is Black. Awesome black polish. Two coats and pure perfection. I actually could have gotten away with one coat this time around, but I went for the two because I did notice a few nails had some bald spots. When my black base was dry, I started to use my white acrylic paint and add the white dots. Normally, I would have used white polish, but all my whites decided to turn goopy. Wait, I have that new Sally Hansen one I could have used! Dang it, anyway, I used acrylics because I forgot about that polish until now as I type this. This is what happens when you have too many polishes, you forget about what you actually own Goodness. Anywho, after I let the white dry, I went through and dotted Ghoulish Glow, China Glaze's glow in the dark top coat, over the whites of the eyes. After that was dry, I took some black acrylics and made the pupils. 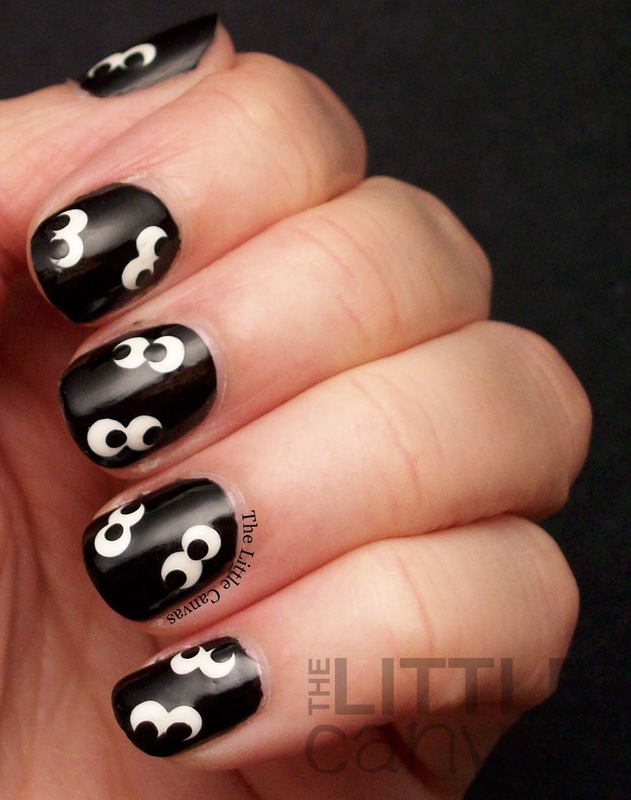 The addition of ghoulish glow is really what makes this manicure! The eyes actually glow! This year I couldn't capture a photo of it. My camera just refuses to pick it up! What do you think? 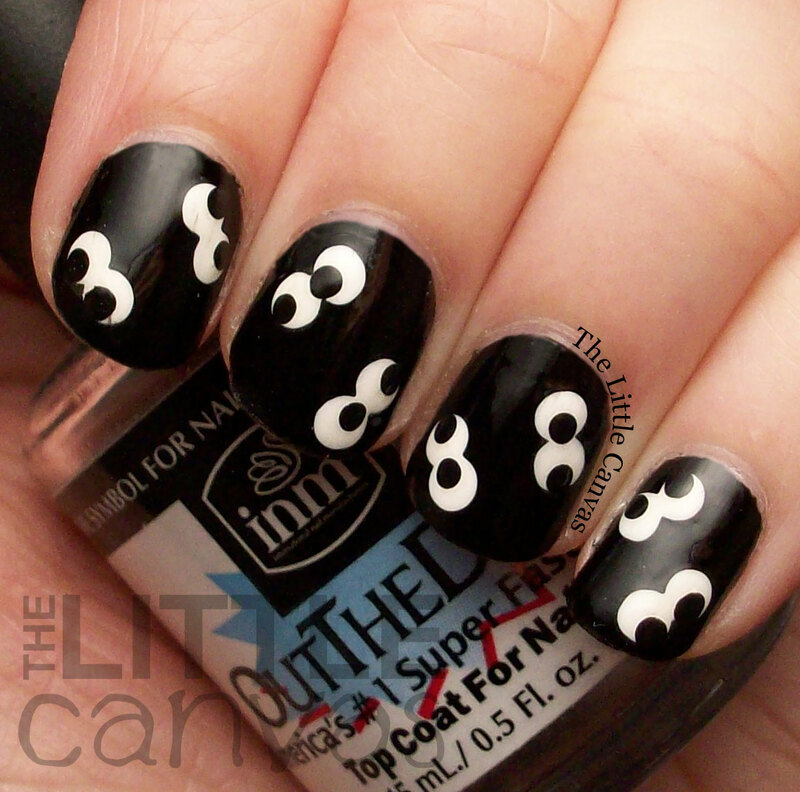 Cute Halloween manicure? 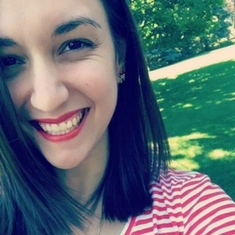 Don't forget to check out the other Twinsie's! Posting a tutorial tomorrow and Thursday! Friday I'll be posting an actual manicure! Busy week here!